Figuring out how to pay for college can certainly be an overwhelming process. However, there are many resources available to North Carolina residents that can make the process a little bit easier. For example, there are federal, state, and even private funding sources you can consider. Don’t know where to start? No worries. We’re going to explain all of these options. Are you ready to start your college journey? Let’s talk about the four steps all North Carolina residents should take to fund a college education. The first step for any student seeking aid is to fill out the FAFSA. FAFSA stands for Free Application for Federal Student Aid. Although the FAFSA isn’t a lot of fun to fill out, it might be the most important part of the entire financial aid process. Even though the FAFSA can seem like a pain, it definitely has its benefits. Just by filling out the form, you will automatically be qualified for federal grants, federal subsidized and unsubsidized loans, and some state grants. FAFSA can be tricky to fill out the first time around, so you might want to check out our step-by-step guide to answer any questions you may have. Keep in mind, some grants might have application deadlines that you don’t want to miss. The sooner you fill out the FAFSA, the better. You can even apply before you know which school you’ll be attending. As noted in step one, you will automatically be qualified for some (but not all) grants and scholarships just by filling out the FAFSA. The colleges you apply to will look at your FAFSA and automatically qualify you for certain state programs that are available to you. These programs will appear on your financial aid letter from each college. To begin your search on state funding, you may want to browse the College Foundation of North Carolina (CFNC) website. This website offers helpful information to North Carolina residents regarding different forms of college funding such as grants, scholarships, part-time work, and more. They also offer a free online course on financial basics as an effort to teach students financial independence. The University of North Carolina Need-Based Grant for students attending one of the 16 campuses of the University of North Carolina. Teacher Education Assistance for College and Higher Education (TEACH) Grant Program for undergraduate and graduate students enrolled in a post-baccalaureate teaching program. Rehabilitation Assistance for the Blind and Visually Impaired for students who are blind or visually impaired. This program helps to assist these individuals in finding employment. You can find out more about North Carolina grants at CFNC.org. Besides grants, North Carolina also offers a number of scholarships for residents. A list of other North Carolina scholarships can be found at CFNC.org. If you are a high school student, it’s wise to regularly check in with your guidance counselor so you can stay up to date with any local scholarships. Stay on the lookout for other scholarships advertised on your guidance counselor’s bulletin board or on your guidance counselor’s website. Remember, another smart option is to do your own searches online. There are plenty of scholarships out there, you just have to find them. Check out the websites of North Carolina colleges or call their financial aid offices to get more information. You can search online for your major, military scholarships, scholarships for women, etc. You can also search for county-specific scholarships. For example, Cumberland County has 17 different scholarships just for Cumberland County residents. For a complete list of North Carolina scholarships by county, click here and scroll to the bottom. In addition, North Carolina offers a 4-H Scholarship to students who have an outstanding record of a 4-H club participation and achievement. CollegeScholarships.com also has a variety of scholarships available to North Carolina residents. Sallie Mae's Scholarship Search is a good research for your scholarship hunting. This is a scholarship database that is constantly updated. Another helpful resource to begin your scholarship search is Big Future by College Board. There, you can find aid from more than 2,200 different programs. Not only is this a great place to search for scholarships, Big Future can be useful in the process of picking a major and even finding a career. 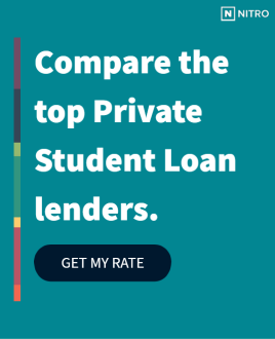 If you’ve exhausted your options between grants, scholarships, and federal loans, a private loan might be able to provide you with the remaining difference of funds you’ll need. Before taking out a North Carolina private loan, check out our free NitroScore tool. Just enter a college and a major, and the tool will calculate your total cost of education. Plus, the NitroScore tool will predict your salary after graduation and forecast how much of your salary per month will go towards paying off your student loans. Then, you will receive a score that tells you how easy or hard it may be to pay off your student loans. You can customize the results of the score with a variety of factors such as scholarship money and savings, and you can compare different college and major combinations. There are many resources available for North Carolina residents to help fund a college education. You can’t start the process too soon, so start planning for college today.